Library tourism! Do all librarians love it? I think signs (probably) point to yes. 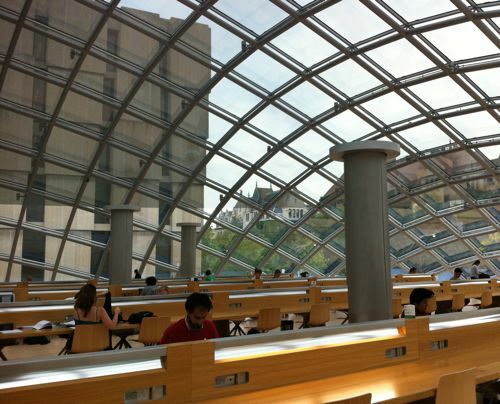 Last month we took a quick vacation to visit family and friends in the Midwest and had the chance to indulge in some library tourism, too, in a visit to the new Joe and Rika Mansueto Library at the University of Chicago. Even if you’re not a library nerd you may have heard about Mansueto: last fall Wired ran a short piece about it last year when it opened. Lots of large research libraries have run into trouble storing their collections in recent years as their available shelfspace has filled to capacity. Some of those libraries contract with offsite storage facilities, typically a good ways away from the campus, which deliver requested books daily. At the U of C they decided to turn the tennis courts next to the enormous Regenstein Library (the main non-science library on campus) into an onsite storage area…using the power of robots! Mansueto is not tall aboveground but cuts an imposing figure nonetheless: a broad glass oval-shaped dome on the lawn. The dome encloses an incredibly quiet reading room and a preservation and conservation laboratory (very cool, like the visible science exhibits at natural history museums), divided in the middle by the circulation desk. But the real secret is below: a book storage system that reaches 50 feet down underground and uses robotic cranes to retrieve items requested by readers. The robot library of the future! Unfortunately there weren’t any tours happening on the day we visited, so I can’t share any crazy robot photos with you, but there are some cool videos on the Mansueto website if you’d like to check out the robots. I felt a little guilty even walking around the space — it was really quiet, and I think we got the stinkeye more than once as we tried to tiptoe around. The reading room has long tables with lighting and outlets and I could instantly see myself getting lots of work done in that kind of space. Have I mentioned how quiet it was? There were also a few study rooms — essentially glass cubes with a desk and chair inside. They’re really beautiful. 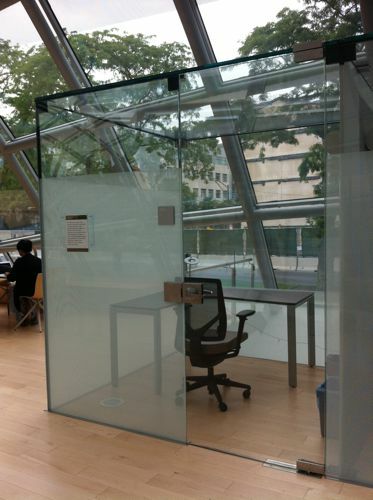 It strikes me that these glass cubes might be a good solution for libraries that want to add study rooms in spots that weren’t originally designed for them. For example, at City Tech we have a 2-story library with one long wall of windows. We’ve been thinking of doing some rearranging so that we could accommodate more study rooms, but we probably don’t want to put them along the windows because that would restrict the amount of natural light that the rest of the library gets. A glass cube study room could go anywhere, even in the middle of a room. As @lwaltzer and the U of C responded to a tweet of mine, we could call them thinkquariums or think tanks! Perhaps you saw the article in last week’s Chronicle of Higher Ed about the difficulties of searching library catalogs. No? Librarians have been chatting about it all week. I’ve been chewing over it too, and finally have time to get down some comments. It’s true that many library catalogs and article databases have poorly-designed user interfaces, I absolutely won’t argue with that. And it’s very frustrating, both as a librarian and a user. However, the article seems to muddle a few different issues. 1. 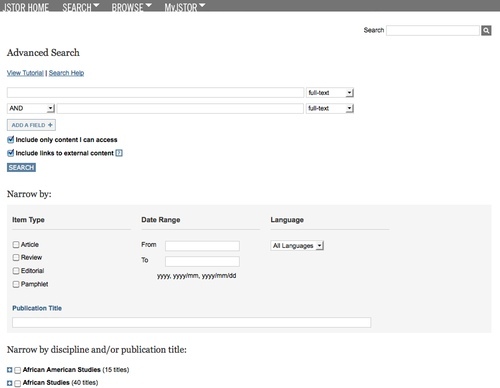 Online library catalogs provide keyword searching, but they also allow searching by title, author, or subject. My guess is that if the student had searched for Jefferson by subject, her search would have been successful. Of course, with the ubiquity of the internet everyone has become more accustomed to keyword searching (including librarians). But, frankly, a keyword search of Thomas Jefferson on the internet also wouldn’t produce the results that this grad student needs (umm, Wikipedia?). As librarians, we need to remind our users that for simple questions, simple internet searches will usually suffice, but more complex information needs will require more complex search strategies. 2. Books in libraries are organized by subject, just as are books in bookstores. Of course librarians assign call numbers to books to catalog and organize them, but the call numbers are arranged by subject; thus library stacks can be browsed in the same way as at bookstores. Maybe we also need to remember to emphasize that to our users. At my library we have neat bookmarks with the Library of Congress call number ranges printed on them that we can pass these out to students at the reference desk — I need to remind myself to do that more often. 3. 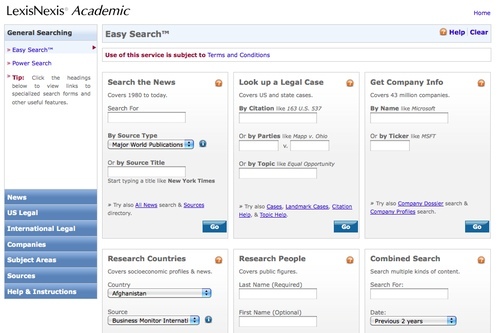 Article databases can be particularly difficult to use, especially for novice searchers. Database interfaces are complex, and it’s confusing to students that there are so many different interfaces to learn to use. 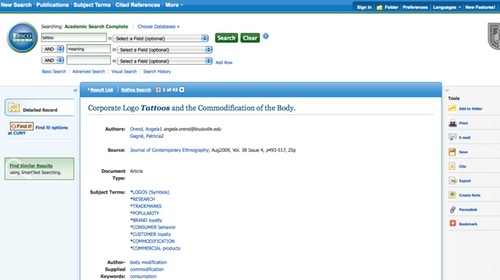 This is a direct result of the economic and production history of scholarly journal publishing, but knowing this doesn’t make the reality of searching article databases any easier. 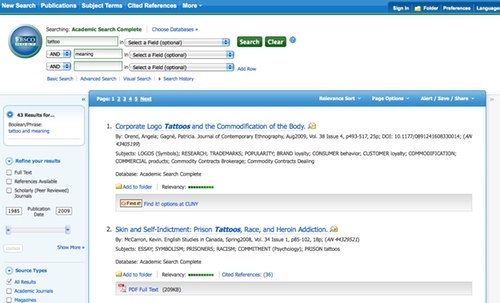 Yes, new products can search across multiple databases and the library catalog at the same time (called federated searching), but they can be clunky to use. And they’re usually expensive, too. I’m excited about new solutions coming down the pike, but (like some of the commenters on the Chron’s piece) I’m hesitant to believe that one, magical, Google-style search box should be the utopian goal for academic libraries. Scholarly information is complex. It’s text, images, data, audio, video, some “traditionally” published and some not so much, and it’s in all sorts of places on the internet: free, paid, and in-between. It would certainly save us a lot of time if we had a search engine sophisticated enough to find the scholarly info we need amongst all of the billions of pages non-scholarly content on the internet. 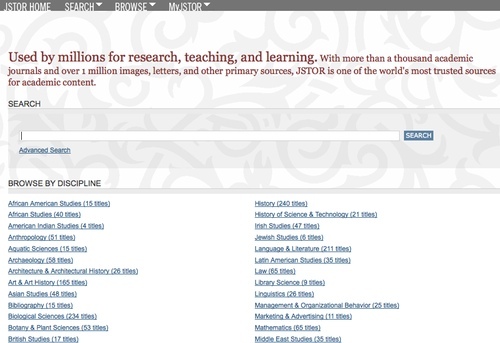 But isn’t searching an important part of the scholarly process? Doesn’t it help us refine our questions and discover new areas of interest? Or maybe it’s just that I like searching. Which, I suppose, is why I’m a librarian.